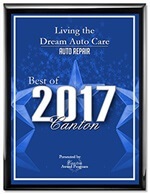 BEST PLACE for all your auto service needs! Paul and his crew know their stuff, they kept me informed through this journey. They go above and beyond, I can't Thank them enough for all their efforts. When you enter Julie greets you with a smile and is so pleasant. HIGHLY HIGHLY RECOMMEND! Canton is Lucky to have you in their town. My 10 yr. old pick-up needed a lot of work. It took a couple of days to get all the needed parts, but they kept me informed of every step. I was already a repeat customer and will continue. I used to dread anything car-related as it was always a hassle, and I never had a comfort level that the person I took my car to had my best interests at heart. I felt like the repair person just saw dollar signs when I walked through the door. Living the Dream IS a dream! They are so friendly, personable, and professional! I know they will fix what Needs to be fixed, and gently recommend other things but there is no pressure. I feel like I have a partner to help me with my vehicles. Thanks for being such talented and great people!! Always professional and helpful. I generally do all my car servicing with them. Trust is paramount and I trust LTDAC. Keep up the great work guys! As always, Living the Dream did not disappoint. Friendly and efficient service! Great customer service, reasonable prices, professional staff and great craftsmanship. Highly recommend using them for all aspects of service needed on almost any year, make, and model of vehicle.